Bookings for parties of 8 or more please call 01384 390940 and book via our friendly staff. 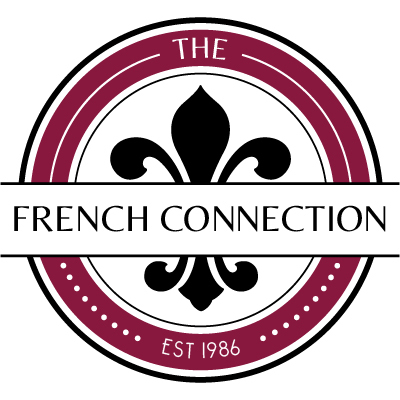 Welcome to the French Connection Bistro. Established in 1986, The French Connection is a traditional, French café bistro. We serve individually prepared, fresh, French-style dishes, using high quality ingredients. This intimate, classic café bistro offers vibrant breakfast, lunch dining and transforms into a romantic, boutique, restaurant for full à la carte evening dining. Our menus change regularly to reflect the seasonal availability of produce and for a special experience we offer occasional themed evenings, focussing on regional dishes from all corners of France. Our head chef has over 24 years’ experience here in our own kitchen and will cook each dish with attention to detail in accordance with the highest traditions of French Cuisine. Unlike most traditional French restaurants, we offer an excellent selection in vegetarian dishes and can cater for all dietary requirements. In complete harmony with our French counterparts we offer a great flexibility in child portions, to enable families to eat together. Love the new menu and specials board. The food was well presented and tasted delicious. I was happy with the smaller details such as the ribboned salad vegetables and well seasoned and dressed leaves. I will def return as it easy to book online and receive an instant confirmation. Unfortunately it was very quiet the evening we visited so the atmosphere was a bit flat. However the food was very good and the wine recommendation excellent. We will return. Attentive staff,great tasting food, at a fair price . A lovely evening out with friends. Enjoyable evening in a pleasant vintage interior. Brings back good memories from way back. Lovely food and atmosphere. Will definitely come back. Atmosphere marked down only because it was untypically empty! Day after an "event evening" probably a lot to do with that. Very good new menu, though surprised to see no soup in the starters. Excellent evening out at the moulesand frites evening. Very simple concept but worked very well and made it very efficient. Excellent service and food as ever. Love this place and the food. Enjoyed the lunchtime Menu de Jour. Beautiful food and superb value. Only one minor comment: plates very hot, which is great in principle but means the poached eggs carry on cooking after being served! We like them more runny (on toast, and in Eggs Benedict). But great breakfast as ever. Wonderful breads, salads, fish dishes, authentic French Cuisine. The food was extremely expensive for what it was compared to the last time we visited (bear in mind there is a new cafe opened up round the corner from there which is far better. Friendlier staff and much cheaper and nicer food. We shall go there in future and recommend our friends not to use The French Connection. My friends and I have visited The French Connection many times. We always enjoy going there , for breakfast, lunch or birthday celebrations. Great food, excellent service. A Little hidden gem for a relaxed lunch! Very interesting for a number of our guests.They left very little of the food they had.So in light of that it was excellent.All expressed  how much they had enjoyed the experence.The staff are friendly..and witty. Good service.good value. Some cool jazz.pretty good.Good  pre booking information. Colquitt.Roach.Co.